Well they did just that, and they’re not the only ones. It seems that Chipotle inspired restaurants combining fresh, quality ingredients and a preparation platform with enough haste to meet the demands of today’s on-the-go consumer has caught on- giving chains like Blaze Pizza a competitive advantage. 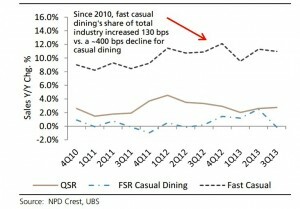 According to a recent Business Insider article by Ashley Lutz, “Growth of fast-casual chains like Chipotle is outpacing traditional restaurants,” while sales at chains like Pizza Hut “…declined 2% last year.” This chart below, from the same Business Insider article perfectly captures this alarming trend for traditionally paced casual diners. The layout and process design at Blaze Pizza is flawless and something the consumer can count on. It’s literally as if customers are viewing a mini supply chain process in front of them as they watch their pizza being made. With easy functions for employees to carry out by simply listening to what the consumers would like on their pizzas, it is easy and inexpensive for Blaze to hire and train cheap labor- an aspect which often burdens others in an industry rampant with high employee turnover which is further complicated by the frequent introduction of new technology and alterations to the menu. With Chipotle inspiring companies such as Blaze Pizza, where else do you think this type of setup could catch on, and is it strictly limited to the food service industry? This is a great article! A Blaze pizza just opened down the street from where I live. The store operations that companies like this use are nice because you can be in and out of the store in little time. It is like fast food in how the food is served so fast the difference is the food feels more fresh. I think the operation used at Chipotle and Blaze are not only a new way to allow the customer to pick what they want,but its efficient in how the toppings and add-ins are already for the worker to use. I think the next food service industry to do this will be burgers. Burgers are already so customizable that I think its only a matter of time before a new food place opens using the same operations that Chipotle and Blaze use. I really enjoyed your post as I recently discovered Blaze and love going there! Just like Chipotle, it is quick and easy and you feel like you’re getting a better quality of food than you would at other “fast” food restaurants. You can see all of the fresh ingredients they use before they cook your made-to-order pizza. I think this assembly line model is great in today’s fast paced world. What people want is efficiency and quality at the same time and places like Blaze and Chipotle are getting it done! This model could really be used to make any type of food. I agree with Tyler that burgers could be a good route to go next or maybe sandwiches. We already see this model somewhat used at frozen yogurt places, except that usually it is build your own. In terms of other industries, this could be a great model I think it’s just more a question of what kind of time people have. This could definitely be used in clothing stores in terms of customizing an article of clothing with color, size, accents, etc. Obviously this would take more time but they could maybe implement it through an online system. I LOVE Blaze. Someone at work just told me about it a couple weeks ago, and when I came back from actually going last week they asked what I thought. I said, “That place is the Chipotle of pizza.” There is no other way to put it. These “fast casual” style dining establishments are the wave of the future. So many people want things their own way (without the help of Burger King), and places like Chipotle, Roti and Blaze are doing a great job in their respective food categories at giving people just that. Right now, I think the food industry is where you’ll see the biggest growth, and it will expand to wherever someone can find a way to cook something, if it needs to be cooked, or assembled for you in a matter of a couple of minutes. This is a very interesting post and I really like it. Its amazing how Chipotle inspired someone to open a pizza place that operates the same way as Chipotle does. I think the customers really like places like Chipotle and Pizza Blaze because they get to customize their food and they don’t have to wait a long time to receive their food. This idea is very unique and has a lot of demand to it. I believe that companies like Chipotle and Blaze Pizza will be very successful in the fast food industry because of how popular the type of food is. Everyone loves burritos and pizzas, and having that in the fast food industry is very lucrative. I think this can be, or is already, expanded to other types of food, like sushi or pasta. I can’t think of any ideas of going out of the food industry, but it is definitely possible. This was a great article to read. I have never been to Blaze but have heard many great things from my friends. It is very interesting how Blaze incorporated Chipotle’s assembly line process. As a customer it is great seeing the fresh ingredients being used and having your order made quickly. I believe this type of setup is definitely suited for the food industry, and we could see many more places incorporating it in the future. I have never been to one of these, but it seems like a great idea. The biggest drawback of getting pizza is that it takes fairly long to make. I would like to try it out sometime and see if it tastes as good as how a regular pizza is made. If so, this is a great idea! This is such a relevant article because I live near all of these assembly-line restaurants, in fact, I love Blaze Pizza. It’s interesting how companies have adapted to the fast paced life style of Americans these days. Nobody really has time to sit and wait at least 30 mins for their meal to be prepped and cooked when they’re on their way to work or school. And when they do have the time for that, usually most people complain about how long it takes for their food to reach them, we are all living in a generation of instant gratification. It would be extremely interesting to see this type of set up as a retail store in my opinion. I’m not sure how effective and efficient the execution would be but it would definitely be interesting. Really interesting article. I have never been to a Blaze Pizza, but visit Chipotle quite often. The idea is a ingenious way to serve food. They use better quality inputs (food), and are able to provide it in a quick manner. I agree with you that it is like watching a mini assembly line at the peak hours. I think the pizza idea is going to catch on tremendously (who doesn’t love pizza, and quick at that manner). It will be interesting to see what other industries or companies adopt this principle. I think overall the food industry is one area where it will flourish; however, as it becomes more successful other industries may try to adopt a similar concept. Blaze is quickly becoming a go-to pizza place for myself and many of my friends for two reasons: the quick service and the amazing deals. I find the comparison to Chipotle very interesting, because to me, Blaze just seems like another fast food restaurant. However, I will mention that it is also a sit-down restaurant (in the same category as a Chipotle or Jimmy John’s) with quick service. As mentioned above by some of my classmates, I think this particular form of a business model is more well suited for the food industry, and it is where customers will continue to see a lot of growth. This is a great post, and I never realized until now how much the Chipotle has impacted the fast food industry in recent years. It takes the assembly line from Subway and applies it to (and I’m generalizing here) universally loved food that is traditionally made behind-the-scenes. It’s great because it allows direct contact with the customer and eliminates the middle man, a computer in more traditional fast food chains. Customers also have visual contact with their food throughout its entire creation process. The biggest limitation for this process is time. Obviously with pizza, there is some oven time required, but by limiting the size of the pizza Blaze has also decreased its cooking time. Because of this, and to answer your question about whether this idea will expand to other industries, I think right now the interactive assembly line works best within the food industry. This could possibly expand to other commercial businesses, I’m thinking of a toy store model like Build-a-Bear where you can create and customize a stuffed animal to your liking. This could also work in small-scale retail stores where customers can create their own tshirts or other apparel. I love this post. It amazes me how successful Chipotle has become in just a few short years. They have an ingenious product design that allows customization in an easy and efficient way for both consumer and the employees. If you think about the layout of these stores, it is a very simple and sensible approach that could emulate the same success in any field. Think about Subway, Moe’s Southwest Grille and even Coldstone that all use this same production design scheme. The only issue that Blaze Pizza would face is the that pizzas take time to cook which would negate the easy access, in-and-out trait of the other “fast food” restaurants. They have combatted this issue with their fast cook ovens which take approximately 5-8 minutes to cook. All in all, this is a great example of how ideas used by one company can be brought in and found successful in other companies. I think this trend in the food industry is awesome. 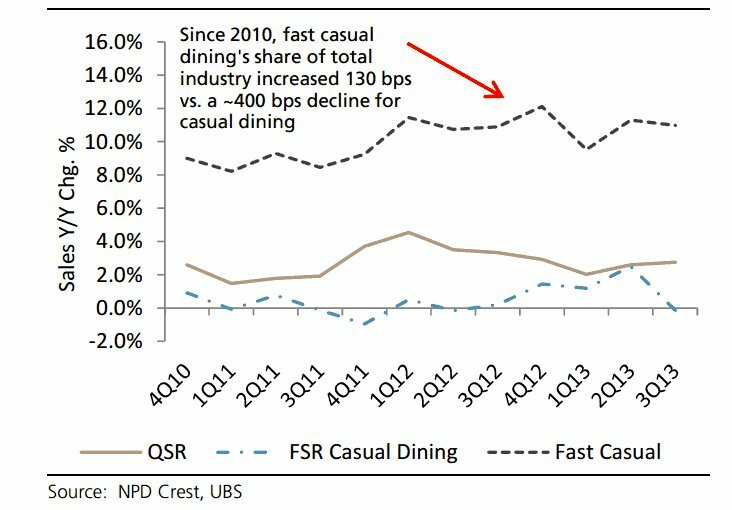 It seems to be catering more to the individual customer while keeping the quality of food higher than normal, which are both good. Within the food industry, I think it could honestly be applied to any type of food, and I hope it does. The concept of customization making its way throughout the food industry is no surprise. Consumers always have a need for uniqueness–to have that control over what they buy. This is why places like Chipotle and Blaze Pizza are so successful in the world today. i believe it is pure genius. The creators of such restaurants understand the consumer and recognize their differences. When I try to think of other areas of food that can incorporate such an idea and carry a similar success, it becomes quite difficult. Whether it is sandwiches, salads, stir-fry, pizza, or burritos, it all seems to have been done. However, it would be amazing if this could be included in some dessert form–maybe make-your-own cookies. With this thought, now both the savory and sweet tooth can be satisfied. Let me start off by saying that Blaze Pizza is delicious! I can certainly see why they have copied Chipotle’s extremely successful design-your-own assembly line process towards food production. However, I feel that this does not always work in Blaze Pizza’s favor. The time that I was there, I noticed how overworked and overwhelmed the employees looked and one person in particular, the oven operator, looked exhausted. It appeared to me that designing a pizza, having the employees craft it, place it on a pan, into the oven, wait for it to cook, and then bring it back out to cut and serve, becomes a really time-consuming and inefficient process. Chipotle certainly takes the bare bones approach and serves the food as is while Blaze Pizza has many more steps involved in the sale/design of their pizzas. 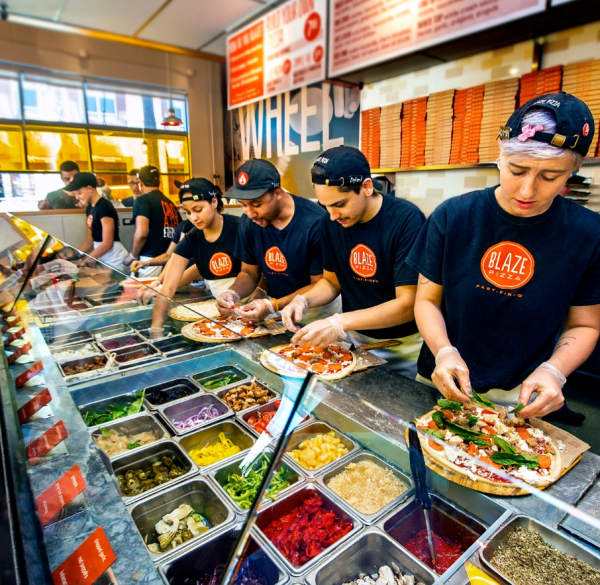 I believe that they have a phenomenal idea, I just think that management need to run operational management studies to attempt to solve the bottleneck issues often seen at Blaze Pizza.